We’re halfway through the four Moveable Game Jams that Games for Change is hosting in partnership with HIVE NYC as part of our 2016–2017 G4C Student Challenge, which invites students to make digital games about civic issues. Over 100 students have attended these events, and learned how to design games about smart technologies and social issues. The Moveable Game Jam initiative began in August of 2013 as a series of game jams for middle and high school students held throughout New York City. With support from the HIVE Digital Media Learning Fund in The New York Community Trust, G4C is working with eight digital learning organizations to implement these youth-focused events: Mouse, Global Kids, Coderdojo NYC, Black Girls Code, Institute of Play, Spazecraft, Brooklyn College Community Partnership, and Museum of the Moving Image, as well as experts in game-based learning Matthew Farber and BrainPOP’s Kevin Miklasz. Energy experts from Current by GE lead a workshop on the topic of Future Communities at the Museum of the Moving Image. As with most game jams, such as the Global Game Jam or Climate Game Jam, each event centers on a theme and challenges participants to create a game about a topic in a short period of time. The Moveable Game Jams are daylong events that start with an introduction to the game design process and rapid prototyping, workshop activity with a theme partner, and then a series of hands-on game stations where participants can learn different aspects of game design. Each game jam’s unique curricular content is being documented into the Moveable Game Jam Guide, so anyone can host a similar event, in an out-of-school setting, or a classroom to teach social change through a games and project-based approach. The guide will build on prior game design learning activities developed in the 2013–2014 program, and will be disseminated through the HIVE Learning Network next year. Youth engaged at one activity station at the October 15th Moveable Game Jam. First Two Game Jams a Success! G4C hosted two Moveable Game Jams this fall. On October 15, the Andrew Freedveaman Home in the Bronx hosted over 50 students from across NYC. Three professional game designers, Kirk Musngi, Geoff Suthers and Ben Norskov, presented to students about their school and career paths and game projects, answering questions about how they got into game design, what kind of tools they use, and why they love making games that tackle real world issues. “Whatever you’re passionate about, put that in your game,” encouraged Kirk. Then students started jamming. 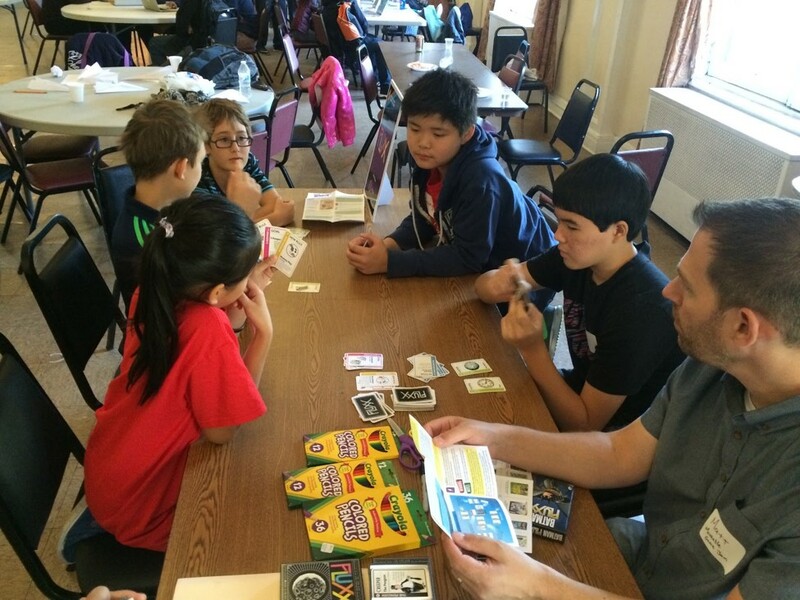 One station challenged students to play, and then modded a commercial card game. Educators from the Museum of the Moving Image took a transmedia approach, encouraging students to turn movie plots into board games, Coderdojo NYC volunteers taught kids how to make a haunted house in Scratch, and DJ Spazecraft explored sound design and playful remixing. 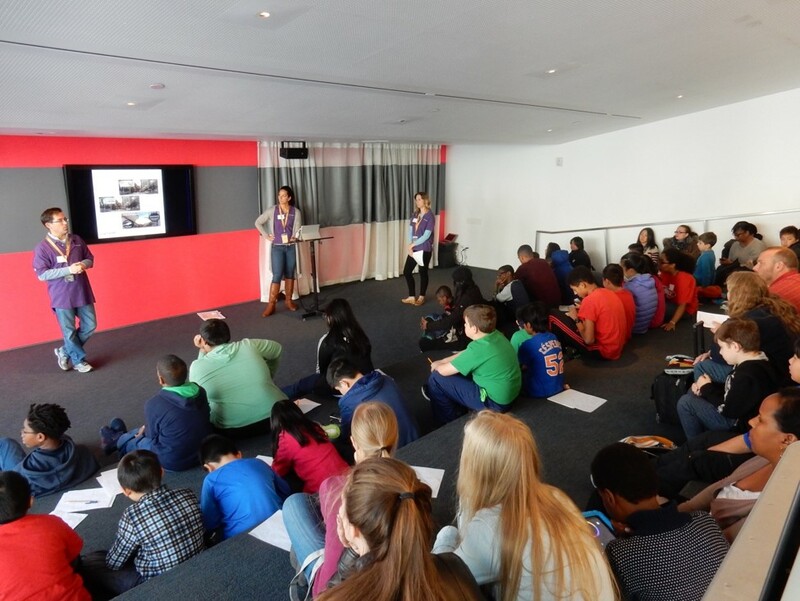 The second game jam took place at the Museum of the Moving Image in Astoria, Queens, on November 5th. The theme of this event was Future Communities, one of the G4C Student Challenge themes that students can choose from in creating original games to submit to the competition. Guest speakers from Current powered by GE talked about smart cities and ran a smart tech workshop for students. In the game stations, students reimagined Oregon Trail to be set in a future city with the Museum staff, managed recycling systems with CoderDojoNYC using CSS and HTML, designed car shares using Scratch with Global Kids, and used Twine to tell stories about sustainable urban living with Mouse. Kids design car shares at the Global Kids station at the November 5th Moveable Game Jam. When students bring their own interests and passions to learning, they are empowered. They view themselves as creators—rather than consumers—of new media content. 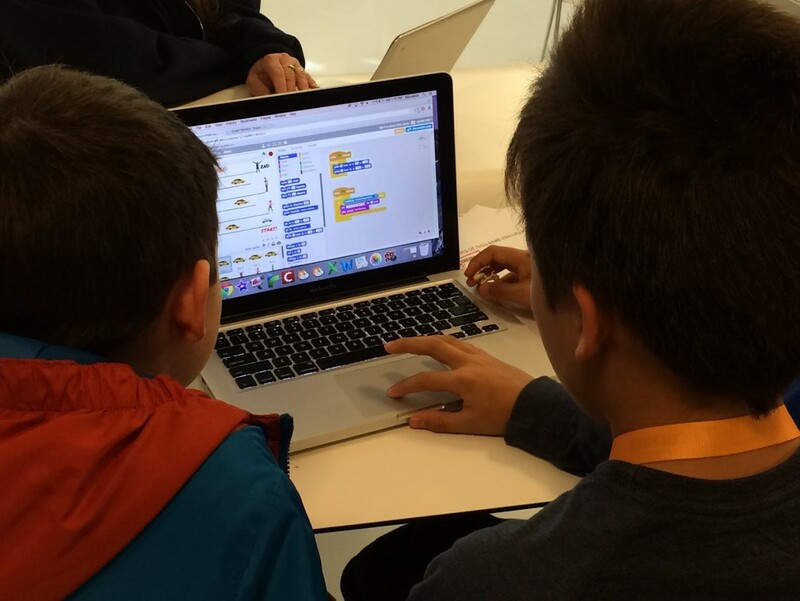 As they code games, children learn system thinking principles, as well as iterative design. 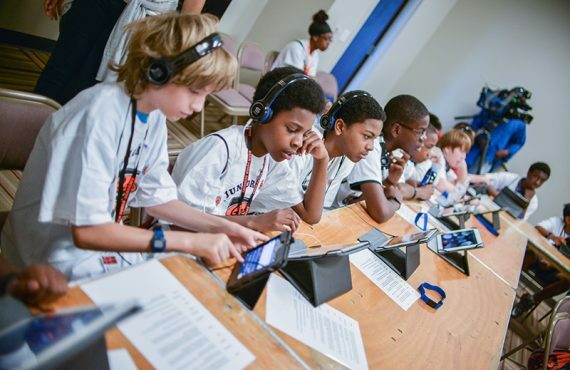 Student game design is one of the multiple entry points to onboard 21st-century learners. The next Moveable Game Jam will be held at the Brooklyn Community College Partnership, on December 10th. This game jam is themed around Climate Change and will feature guests from NOAA. The final game jam is on January 7th at the Jefferson Market Library in the West Village, Manhattan. This event will focus on the Challenge theme of Local Stories & Immigrant Voices, supported by the National Endowment for the Humanities and a consortium of NYC historical societies and scholars.